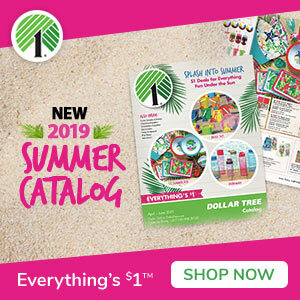 June is a month of transitions – the season changes from Spring to Summer and major life changes take place with graduations and weddings. This month was filled with wholesome treats to power study sessions, exams, fuel up on the way to events and to simply start the day off right with something delicious. 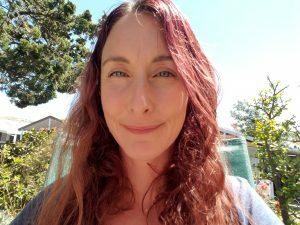 Whether I am facing a new challenge at work or making adventures with my mischievous children ~ I got this! 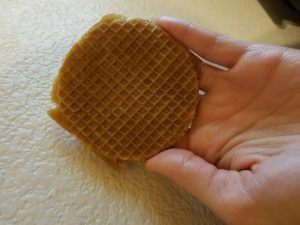 StroopWafel by Daelmans ~ A traditional treat from Holland that is centuries old. Soft, toasted waffle filled with caramel, cinnamon and real bourbon vanilla. Very hearty tasted and not overly sweet; I would devour these any day. A+ 5 Stars ~ hands down, delicious! 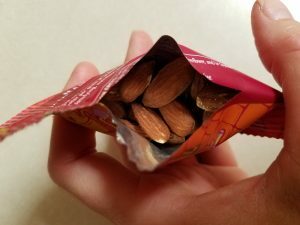 Roasted Almonds by Crown Nut ~ Comes in a kid-friendly and appealing 105 calorie bag. The almonds are roasted in a mixed oil medley of canola, safflower, sunflower and / or soybean oil. Clean, earthy, hearty flavor which my youngest son devoured; eldest son has braces currently much to his chagrin. PB&J Toasty Crackers by Lance ~ Old-school cracker snacks made with Welch’s grape jelly. Real ingredients and really delish! Lance has been around for quite a while and has upped their game with a fun-filled sandwich cracker.. Crispy, slightly buttery tasting crackers with a bit of peanut butter and Welch’s grape jelly within. These are very tasty but, could use a tiny bit more peanut butter ~ youngest son’s review. I would have a picture but, he is 8 and I turned my back ~ the food literally disappeared. 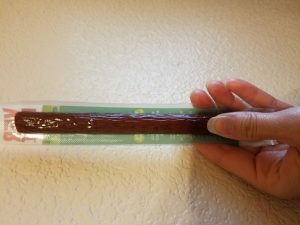 Beef & Pork Stick by Vermont ~ Cracked pepper flavored meat stick made from beef and pork raised without antibiotics, no added hormones, vegetarian fed and gluten free. No heat or spice but, full of meaty flavor; juicy not dry nor chewy. My youngest son ended up eating over half of it instead of it being my snack. Tortilla Chips by RW Garcia ~ Yellow & blue corn chips made by a family owned company since 1982; high quality and sustainable ingredients. 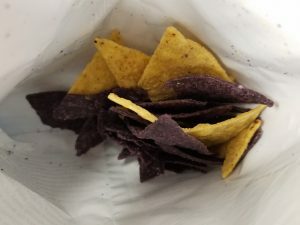 A blend of sweet, nutty, blue corn tortilla chips with the traditional taste of yellow corn tortilla chips. The only downside is the amount of chips in the bag; very sparse. Beanitos ~ Both the product and company name. Baked white beans with a crunch and flavored to taste like macaroni and cheese. 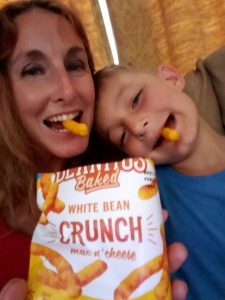 “Healthier” alternative to Cheetos, my sons truly enjoy Beanitos and so do I! Full of crunch and cheesiness. Angel Mint ~ 1 1/4″ long mints. 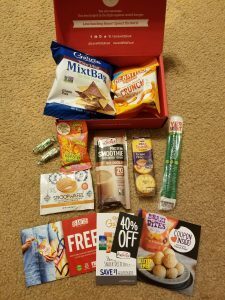 FlapJacked discount code, Gobble discount, BraziBites coupon, RW Garcia coupon and a coupon for a FREE bag of Beanitos!